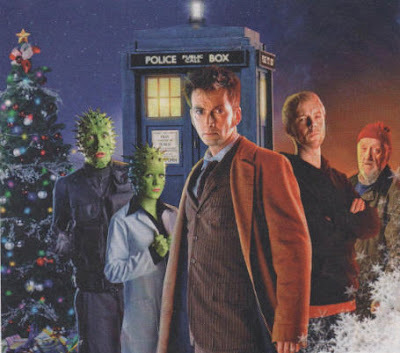 So Mr. Tennant's time is almost up and by New Years Day Matt Smith will be taking the role of Dr. Who. 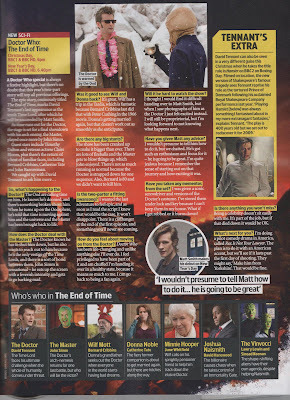 Christmas Day will see the beginning of the end for our current Doctor and to whet your already insatiable appetites I've scanned in a page of the most recent TV & Satellite Week magazine which gives away a few bits of info you might not know, including casting, plot spoilers and images. Also, I never mentioned this before (although it's old news if you've been following the online updates) but did you know that Timothy Dalton will be appearing as a Timelord?... Yes that's right, he's mentioned in the interview below but it doesn't say who he is in the episode. Recent set info stated that Dalton was seen in full Timelord garb with flowing gown and collar, so is he another Timelord that survived as well as the Dr and the Master? Is he a flashback in the Dr's mind from before Gallifrey was destroyed? Or is he some sort of transition stage for the Master? We'll have to see. Click on the scanned image below to enlarge and read the whole thing.